The vast Burragorang Valley, which extends southward from Mt Solitary towards Bowral, and on its western side meets the southern end of the Megalong Valley-Jenolan Range, with the imposing Kanangra Boyd wilderness beyond, remains a region of mystery; for hidden in those wilds may be countless megalithic stone arrangements and other reminders of the lost Australian civilisation of Uru. The central region of Burragorang is today flooded and part of the Warragamba Dam backwaters, which cover the old town of Burragorang and its former outlying farmlands and early shale mining operations. Former inhabitants have spoken of the hundreds of Aboriginal rock art sites that the scientific community failed to record before the flooding. 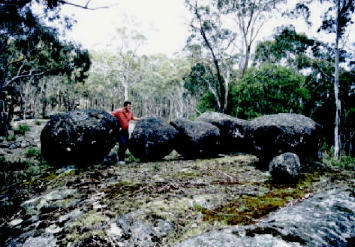 Rex Gilroy examines an alignment of huge granite boulders, arranged on an north-east/south-west axis. 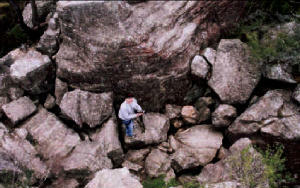 This site, which contains other stone arrangements, discovered by the Glroys. is one of several hereabouts which convince them that the Kanagra Boyd plateau was once a major Uruan astronomical centre. Photo © Rex Gilroy 2004. 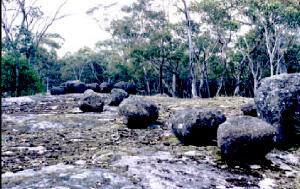 Others have spoken of mystery megalithic stone arrangements and strange rock engravings that also existed in the surrounding bushland now lost forever. These sites were back in the hills, above the former waterline of the previous post ice-age lake, whose waters were part of the great waterways of the Sydney Basin, as described in Chapter Three. The Burragorang waters extended into the eastern end of the Jamieson Valley and into the southern end of Cedar Valley, which lies on the western side of Ruined Castle, between there and Narrow Neck Peninsula. Waterfront settlements must have existed in these two valleys, and the Ruined Castle linked to them by ancient pathways now completely lost or barely visible in places. During fieldwork in the early 1970’s I found traces of what may have been an ancient wide pathway, which led from the eastern base of the ‘Castle’ along the northern base of Mt Solitary and down to the former water’s edge. This great lake would have covered the area now occupied by Jamieson Valley Farm. Signs of ancient terraced crop growing occur in both these small valleys where bush foods were cultivated. However, it is the ancient ‘lost’ Uruan rock engravings of the Ruined Castle with which we are concerned. The ‘Castle’ was mined for kerosene shale in the late 19th century, and a single gauge railway line extended to its base from the Katoomba Falls coal mine, the shale cars pulled by bullocks. The remains of some of the miners’ stone huts can still be found near the Ruined Castle’s base. Rex Gilroy standing on the collapsed broken floor of the Nim Sun temple on the 'Castles' summit. A search of rocks around the Castle’s base later turned up a number of ancient ogham-type strokes and other symbols. priest. This is declared by Hun”. Here was the first mention of a Queen of Uru found in any Uru inscription. What territory, and from where, did Queen Da-i rule? Was she a monarch who ruled from somewhere in the Sydney Basin district, perhaps the ruler of a vast territory which covered the coastal lands far to the north and south of the Sydney district? Another revealing inscription included symbols for a pillar, the moon, phallic and Earth-Mother glyphs and ships. “Three phases of the Moon have been observed from this pillar. The Sun-ship brought the priestess Ianod for mating with the divine Sun*. “Assemble all here for prayer or petition. Another set of engravings appear to depict a priestess figure with accompanying female attendants in the act of praising the Sun disc with raised hands atop the long-since collapsed ‘Castle’. There have since been found a number of other inscriptions in and around this great formation, to show that, several thousand years ago, at a time when it was in better condition, the Ruined Castle had been utilised as a megalithic sun-worship temple of the Uru, which rose above a settlement established at its base. The inscriptions, all “Archaic Uruan” suggest the site was permanently occupied by a priestly caste at the head of which were a high priest and priestess, who officiated in ceremonies at the summit altar, sacrificial offerings being made daily when the sun was directly overhead. The Sun may have been ‘welcomed’ and ‘farewelled’ every dawn and dusk atop this natural monument.